No one likes to think about getting older, and lawyers may tend to put off thinking about the day they have to retire from the profession they love and the firms they have spent a lifetime building. However, the fact is that there is a wave of Boomers hitting retirement age (90 million in North America over the next twenty years) and according to the American Bar Association 65 per cent of law firm equity partners are in their late 50s and early 60s. So before long, many lawyers and firms will need to turn their attention to this issue. 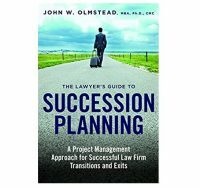 The Lawyer’s Guide to Succession Planning, by John W. Olmstead aims to give lawyers a roadmap to help them consider the options available to them. Olmstead has been a legal management consultant for over thirty years, and says that over 80 per cent of his law firm engagements now involve succession planning. His book is based on his observations of both firms that set plans in place well in advance, and those that have buried their heads in the sand and faced a crisis when key people depart. Waiting too long to begin the process of succession planning can have serious consequences to the health of the firm. Clients may leave when a lawyer retires, as could key staff or other lawyers. If that lawyer represented a large amount of business, the firm’s finances could suffer. In the case of a solo firm, a lifetime’s worth of sweat equity could amount to nothing if the firm simply closes its doors. To prevent this, Olmstead recommends that planning begin at least five years before a contemplated retirement date. The entire process begins with lawyers accepting the fact of aging and being willing to contemplate no longer being part of the firm. Olmstead has found that for many lawyers, the firm is their life and they can’t imagine not practising law. Some plan to work as long as they possibly can, either because their entire sense of self-worth is tied to their profession, or because they haven’t prepared financially and need to keep working to maintain their lifestyle. Olmstead urges lawyers who still have years to prepare to find outside interests that can provide fulfillment, and also to figure out how much money will be needed in retirement and start planning on how to achieve that. How the planning process unfolds depends a lot on the particular nature of the firm. A sole practice may have all its ‘goodwill’ and financial value largely tied to one lawyer, so the question will be whether that can even be passed on to another lawyer willing to buy the practice. A firm owned by a small group of partners may consider laterally bringing in another partner with similar expertise to the lawyer retiring, keeping the lawyer on as of counsel, or merging with another firm. Larger firms can create a partner track for associates who wish to someday be equity partners in the firm. There are a number of courses of action for firms of all sizes. The book gives examples of real firms that have navigated these issues; some successfully carrying on past a vital partner’s retirement, and some waiting too long or finding that a partner was irreplaceable, and so winding up as ‘single-generation’ law firms. A concept outlined by Olmstead is that the WHO will dictate the WHAT. In other words, identify the unique traits of the person retiring and what the firm needs in a replacement. Personal qualities and fitting into a firm culture can be as important to consider as legal expertise. Thinking about this at the outset of a search will affect how the process of finding a replacement will unfold. Though as the search progresses, finding the right relationship fit may require some flexibility on the part of the planners. The last few chapters of the book deal with the practical issues of succession planning: valuing of a firm, creating a strategy for a partner’s exit, and searching for candidates. Appendices to the book include sample sales agreements and partnership agreements, a sample transition plan template and retirement readiness assessment checklist. There is also a chapter on ethics and ensuring that local rules are followed in terms of protecting client interests in the event of firm sales, mergers and transferring files (Ontario lawyers will want to refer to the Law Society’s Guide to Closing Down Your Practice for Lawyers). Retirement is inevitable, and even lawyers who plan to ‘work ‘til they drop’ will want to ensure that the firm can carry on without them, or get the maximum value for what they’ve spent a lifetime building. John Olmstead’s book is a great place to start for firms that are beginning the process of navigating the wave of Boomer retirements heading our way. The practicePRO lending library has more than 100 books on a wide variety of law practice management topics. Ontario lawyers can borrow books in person or via email. A full catalogue of books is available online (practicepro.ca/library). Books can be borrowed for three weeks. 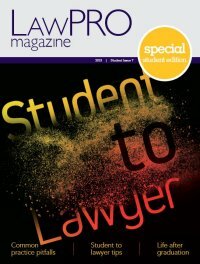 LawPRO ships loaned books to you at its expense, and you return books at your expense.